It seems like everything went wrong for Rush with “Caress of Steel”. They had made positive strides on “Fly By Night”, writing better songs and selling more records than with their debut, so “Caress of Steel” was geared to be their big breakthrough. “By-Tor & The Snow Dog”, their first epic piece, had helped them loosen up a bit, so they decided to see where they could take this. Sadly though, they hadn’t tightened up things to the standard they would on their later records. Even Geddy Lee himself admitted that they were “pretty high” during most of the production, and man does it show. Even the album art didn’t come back right, going for a dull brass look rather than the silver look they had intended (the “Steel” of the title). The record sold far fewer than “Fly By Night”, and the tour was marred with low attendance, being nicknamed the “Down The Tubes Tour” by the band. 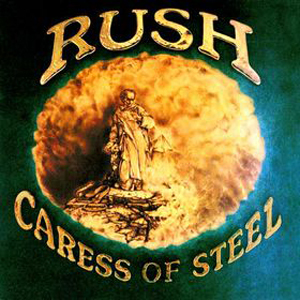 While almost every Rush album has gone at least Gold, “Caress of Steel” wouldn’t even creep up to that standard until almost twenty years after its release. But so what? Lots of Rush records, aside from their seminal ones like “2112” and “Moving Pictures”, are considered underrated gems with lots of variety to offer. Perhaps “Caress of Steel” is the same? …Well, sadly, no. Not really. Look, I’m sorry. I hate to say it, but all the criticisms are pretty much right. Of all the band’s early records, “Caress of Steel” is easily the weakest. Oh it starts off strong, make no mistake. “Bastille Day” is in the same vein as “Anthem”, hitting the ground running and coming out swinging. This would be Neil’s first lyric referencing history, and it’s a strong start for his material in that vein. …And then we get to the second song “I Think I’m Going Bald”, which the band claimed was taking the piss out of KISS, who they were opening for at the time. Geddy’s admission of being stoned during the recording shows the most in this song. Even Neil’s superior lyrics seem half-baked (pun intended), with Geddy stuttering out “I think I’m…I’m going bald” before belting it out in the next stanza. You’d have to be high to think this song was a good idea. “Lakeside Park” is a charming ode to Neil’s days working at a carnival in his youth. It has the same wistful tone as “Fly By Night”, but sadly isn’t as memorable. Three songs in though and the lyrics are all over the place. We have a history lesson, a piss take about aging, and nostalgia for one’s youth. The tone for “Caress of Steel” is all over the place, and sadly none of the songs gel either on their own or as a whole. The lyrics go off the deep end when we get to the closing multi-part pieces, “The Necromancer” and “The Fountain of Lamneth”. Alex’s ominous guitar on the former is all well and good, but Neil’s pitch-shifted narration is what kills it for me. It doesn’t let the ominous mood of the song speak for itself (like say “Witch Hunt” later would) and veers into straight-up Spinal Tap territory. The middle section with Lifeson’s solo is a bit better, but by then the damage is done. “The Fountain of Lamneth” also shows how the band hadn’t really perfected the multi-part piece format just yet. When the song isn’t meandering, it’s repetitive and becomes an odd embodiment of the ending fatigue people would complain about in the “Lord of the Rings” series the band was so fond of at the time. Neil gets a good drum solo in the middle, but it’s just a drum solo and doesn’t add anything to the song, and the band was much smarter for letting Neil’s solos stand alone in concert rather than incorporating them into the song. That aside, “Lamneth” starts and stops and repeats itself and goes off into such random directions that it becomes exhausting and annoying to listen to. Not satisfied with the band’s sales or songwriting, Rush’s record label pressured them to write more traditional rock songs like on their debut, which they had no interest in doing. While they themselves weren’t satisfied with how “Caress of Steel” had turned out, they had no interest in going back to how they were. They were at a turning point; they could either play it safe, or take a risk again.